On August 15, more than 60 faculty, fellows and residents from Bascom Palmer Eye Institute gathered for an informative evening at Miami Lighthouse. Dr. Eduardo Alfonso, Chair of the Bascom Palmer Eye Institute, was in attendance and welcomed guests. 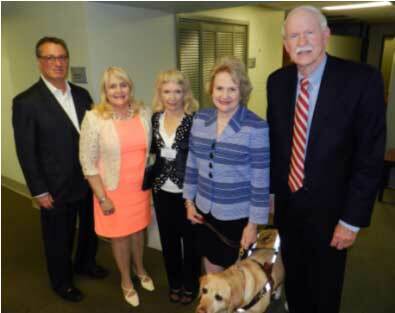 Guests toured the Miami Lighthouse facility, learning about the variety of vision rehabilitation programs we offer, assistive devices and services available in our Low Vision Center. Miami Lighthouse Board Director Harry W. Flynn Jr. spoke about the long history of both organization. Virginia Jacko, President and CEO of Miami Lighthouse spoke about the importance of referring patients to Miami Lighthouse and about continuing the dream of Dr. Bascom Palmer through collaboration. CEO Jacko presented a tribute plaque to Dr. Eduardo Alfonso of a photo taken at the groundbreaking ceremony of the original Bascom Palmer Eye Institute building. To conclude the evening Miami Lighthouse Board Director Thomas E. Johnson, M.D., gave a presentation about patients with prosthetic eyes and their rehabilitation at Miami Lighthouse. 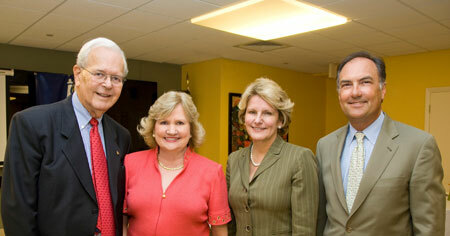 We thank Bascom Palmer Eye Institute for their continued collaboration with Miami Lighthouse. building groundbreaking to BPEI Chair Dr. Eduardo Alfonso. On August 31, more than 50 faculty, residents and fellows from Bascom Palmer Eye Institute gathered for an informative evening at Miami Lighthouse. 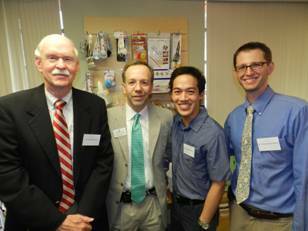 Dr. Eduardo C. Alfonso, Chair of the Bascom Palmer Eye Institute, was in attendance. Guests toured the Miami Lighthouse facility, learning about the variety of vision rehabilitation programs we offer, assistive devices and services available in our Low Vision Center. 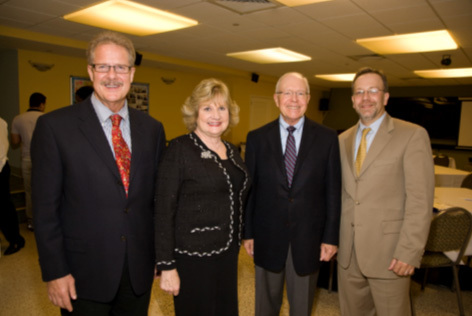 A welcome presentation was given by Miami Lighthouse Board Director Sander R. Dubovy, M.D., Victor T. Curtin Professor of Ophthalmology, on "Continuing the Dream of Dr. Bascom Palmer through Collaboration." Afterwards, Virginia A. Jacko, President & CEO of Miami Lighthouse talked to the participants about how Miami Lighthouse has provided hope, confidence and independence to the blind and visually impaired community for 85 years. To conclude the evening Miami Lighthouse Board Director Thomas E. Johnson, M.D., Professor of Clinical Ophthalmology, gave a presentation about his patients with prosthetic eyes and their rehabilitation at Miami Lighthouse. 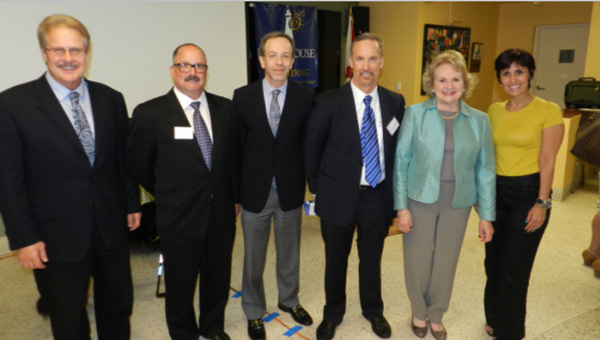 We thank Bascom Palmer Eye Institute for their continued collaboration with Miami Lighthouse. Virginia A. Jacko, President & CEO, and Board Director Sander R. Dubovy, M.D..
On August 26th, more than 50 faculty, residents and fellows from Bascom Palmer Eye Institute (BPEI) along with Miami Lighthouse Board Directors gathered for an informative evening at Miami Lighthouse. Dr. Eduardo C. Alfonso, BPEI Chair, welcomed his colleagues. Guests toured the Miami Lighthouse facility, learning about the variety of vision rehabilitation programs we offer, assistive devices and services available in our Low Vision Center, including functional assessments by our low vision consulting optometrist and on-site and in-home services provided by our certified low vision occupational therapist, Raquel Van Der Biest. 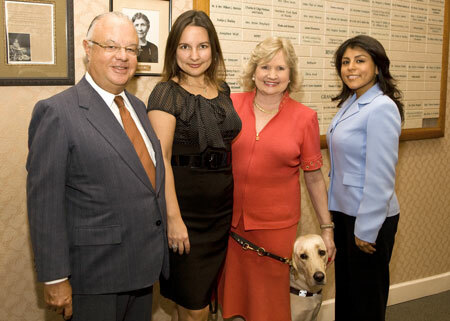 Raquel described the collaboration between BPEI, whose surgeons performed the first Florida Argus II retinal implant, and Miami Lighthouse, which provided vision rehabilitation for the patient. Dr. Harry W. Flynn, Jr., Professor of Ophthalmology at BPEI, was the keynote speaker. He presented a history of BPEI and its longstanding relationship with Miami Lighthouse dating back to Dr. Bascom Palmer’s chairmanship of the Miami Lighthouse Board from 1947 to 1952. Chelsea Haina, Case Manager for our Senior Group Health and Activities Program, spoke about how our SGA Program helps blind and visually impaired seniors adjust to vision loss, how of arts and crafts help develop tactile skills necessary to learn Braille and other important benefits of the program such as alleviating depression and isolation, nutrition counseling and assistance obtaining social services. 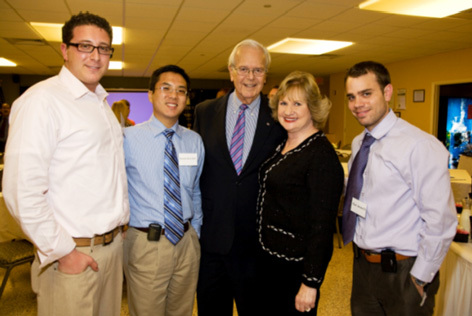 We were honored that David Kurtz, grandson of Dr. Bascom Palmer, attended this year’s reception. The event was partially underwritten by the James Deering Charitable Trust. Heiken Advisory Committee Member Dr. Craig McKeown. On August 27th, more than 40 faculty, residents and fellows from Bascom Palmer Eye Institute (BPEI) along with Miami Lighthouse Board Directors gathered for an informative evening at Miami Lighthouse. Guests toured the Miami Lighthouse facility, learning about the variety of vision rehabilitation programs we offer, assistive devices available in and services provided by our Low Vision Center, including eye examinations by our low vision consulting optometrist, and on-site and in-home services provided by our certified low vision occupational therapist. They also had the opportunity to visit our new fourth floor Sash A. Spencer Educational Empowerment Center. Dr. Eduardo C. Alfonso, BPEI Chair, welcomed his colleagues, and Virginia Jacko, Miami Lighthouse President & CEO, spoke about Miami Lighthouse’s mission. Dr. Harry W. Flynn, Jr., Professor of Ophthalmology at BPEI, was the keynote speaker. He presented a history of BPEI and its longstanding relationship with Miami Lighthouse dating back to Dr. Bascom Palmer’s chairmanship of the Miami Lighthouse Board from 1947 to 1952. On August 28th more than 45 ophthalmology faculty, residents and fellows from Bascom Palmer Eye Institute (BPEI) gathered for an informative evening at Miami Lighthouse. 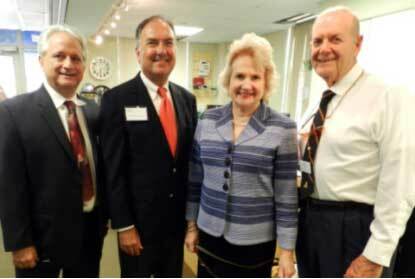 Guests toured the Miami Lighthouse facility, learning about the variety of vision rehabilitation programs, as well as the Low Vision Center and Vision Solutions Store. Virginia Jacko, Miami Lighthouse President and CEO, welcomed guests and spoke about continuing the long tradition of collaboration between Miami Lighthouse and Bascom Palmer Eye Institute. Dr. Maricarmen Perez-Blanco, BPEI Senior Optometric Physician and Miami Lighthouse Board Director served as moderator, and the evening’s speakers were Harry Epstein, former Miami Lighthouse vision rehabilitation client, Dr. Sander R. Dubovy, BPEI Professor of Ophthalmology and Pathology and Miami Lighthouse Board Director; Dr. Thomas E. Johnson, BPEI Professor of Clinical Ophthalmology and Miami Lighthouse Board Director; and Dr. Craig A. McKeown, BPEI Professor of Clinical Ophthalmology and Florida Heiken Children’s Vision Program, LLC, Advisory Committee Member. Virginia A. Jacko and Maricarmen Perez-Blanco, O.D. On May 2nd 2013, fifty seniors interested in age-related eye disease attended a free seminar “Living with Low Vision” co-hosted by Bascom Palmer Eye Institute and Miami Lighthouse held in the Retter Auditorium at BPEI. For details, please click here. More than 50 ophthalmology faculty, residents and fellows from Bascom Palmer Eye Institute gathered for an informative evening at Miami Lighthouse on August 22nd. Guests were welcomed in the Low Vision Center and Solutions Store and then participated in personalized tours showcasing the variety of vision rehabilitation programs available at Miami Lighthouse. Dr. Sander Dubovy, Associate Professor of Ophthalmology and Pathology, BPEI, and Miami Lighthouse Board Director, introduced Dr. Harry Flynn, Professor of Ophthalmology, BPEI who gave a detailed history of the Bascom Palmer Eye Institute and its strong ties with Miami Lighthouse for the Blind. Herb Klein, a Miami Lighthouse client, spoke about how vision rehabilitation services offered by Miami Lighthouse changed his life. The program concluded with CEO Virginia Jacko explaining how Miami Lighthouse transforms the lives of blind and visually impaired babies, children, adults and seniors. 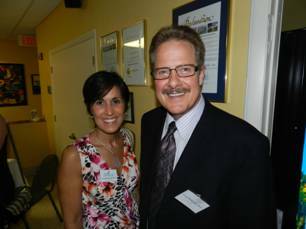 The event was hosted by Dr. Sander Dubovy, Miami Lighthouse Board Director, and Virginia A. Jacko, President and CEO of the Miami Lighthouse. Dr. Bradford Lee; Dr. Christopher Henry. Florida Heiken Children’s Vision Program Advisory Committee. On May 12th 2012, fifty seniors interested in age-related eye disease attended a free seminar “Living with Low Vision” co-hosted by Bascom Palmer Eye Institute and Miami Lighthouse held in the Retter Auditorium at BPEI. For details, please click here. On September 30th 2010, fifty seniors interested in age-related eye disease attended a free seminar “Living with Low Vision” co-hosted by Bascom Palmer Eye Institute and Miami Lighthouse held in the Retter Auditorium at BPEI. Board Director and Associate Professor of Clinical Ophthalmology Dr. Sander Dubovy presented "New Treatments for Macular Degeneration," and President and CEO Virginia Jacko told participants about her vision rehabilitation at the Miami Lighthouse. Maria Fernandez, low vision occupational therapist, spoke to the group about our new in-home services and the importance of a low vision assessment. Carol Brady-Simmons, Certified Orientation and Mobility Specialist and Director of Programs gave a demonstration of sighted-guide assistance for someone with low vision. 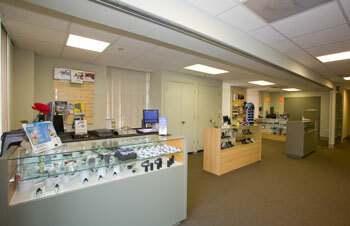 To make an appointment for a low vision assessment at Miami Lighthouse please call 786-362-7479. More than 20 ophthalmology faculty and residents from Bascom Palmer Eye Institute gathered for an informative evening at Miami Lighthouse on August 25th 2010. 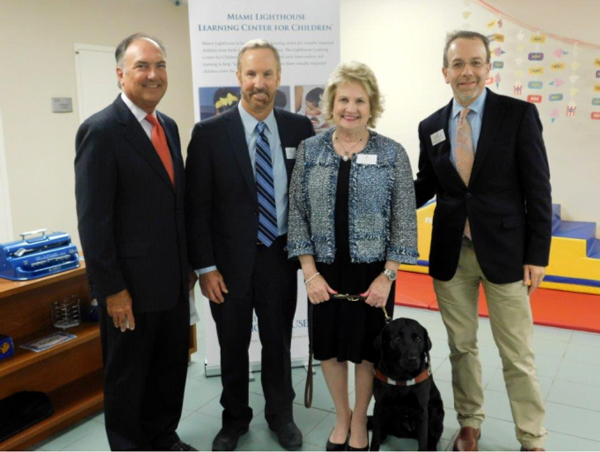 Guests were welcomed in our newly opened Low Vision Center and Solutions Store and then participated in personalized tours showcasing the variety of vision rehabilitation programs available at Miami Lighthouse. Board Chair Owen Freed introduced Dr. Sander Dubovy, Miami Lighthouse Board Director, who spoke to guests about Bascom Palmer’s long tradition of collaboration with Miami Lighthouse. Dr. Rosemary Gonzalez, Miami Lighthouse Consulting Optometrist, and Maria Fernandez, Miami Lighthouse Occupational Therapist- Low Vision Services, presented low vision case study. The program concluded with CEO Virginia Jacko speaking on “A Partnership in Transforming Lives.” The event was presented by Eduardo C. Alfonso, Professor and Chairman of Bascom Palmer Eye Institute and Virginia A. Jacko, President and CEO of the Miami Lighthouse. 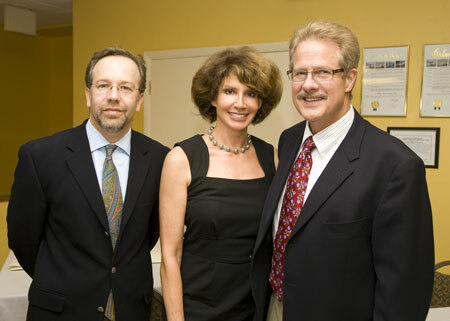 Sander Dubovy, M.D., Miami Lighthouse Board Director. 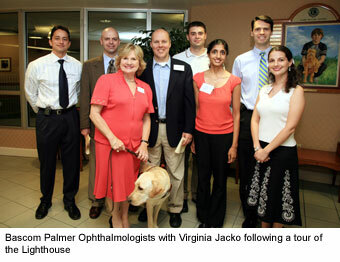 Over 40 Ophthalmologists from Bascom Palmer Eye Institute gathered for an informative evening at Miami Lighthouse on August 26th 2009. Moving testimonials were given by Gert Stein and Furious Berrain, both former clients and current volunteers at Miami Lighthouse. In addition, Dr. Sander Dubovy, Miami Lighthouse Board Director and Dr. Craig McKeown, Miami Lighthouse Heiken Children’s Vision Program Advisory Committee Member, spoke to guests about their involvement with the Lighthouse. Following the program, guests received personalized tours of the modern 37,000 square foot facility and our variety of programs. 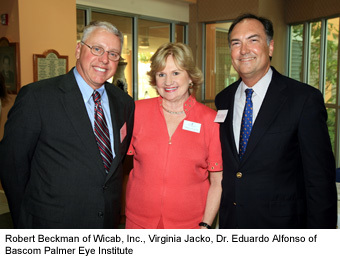 The event was hosted by Eduardo C. Alfonso, Professor & Chairman of Bascom Palmer Eye Institute and Virginia A. Jacko, President & CEO of the Lighthouse. Owen S. Freed, Esq., Chair, Miami Lighthouse Board of Directors; Virginia A. Jacko, President and CEO, Miami Lighthouse; Eneida O. Roldan, President & CEO, Jackson Health System; Eduardo Alfonso, M.D., Chairman Bascom Palmer Eye Institute. 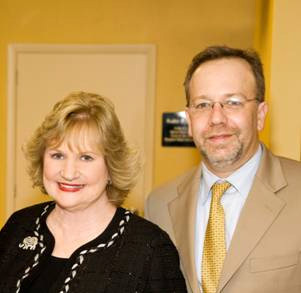 Sander Dubovy, M.D., Miami Lighthouse Board Director; Barbara McKeown; Craig McKeown, M.D., Member, Miami Lighthouse Heiken Children’s Vision Program Advisory Committee. Over 40 Ophthalmologists from Bascom Palmer Eye Institute gathered for an informative evening at Miami Lighthouse on August 20th 2008. Moving testimonials were given by Lighthouse clients. Harry Epstein offered a thank you to these doctors for “saving his life” and the Miami Lighthouse for giving him a “new life” as an advocate for the blind and visually impaired. Latrissa Logan, mother of Ty’quan Logan currently enrolled in the Blind Babies Program also thanked both institutions for their dedication and commitment in helping mothers like herself cope with a blind baby and the many surgeries which are leading toward a very positive outcome. Guests received personalized tours of the modern 37,000 square foot facility and our variety of programs. 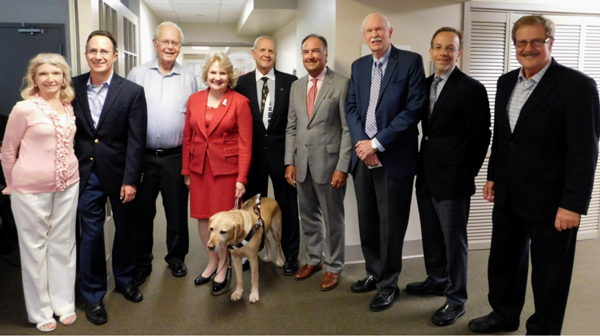 The event was hosted by Eduardo C. Alfonso, Professor & Interim Chairman of Bascom Palmer Eye Institute and Virginia A. Jacko, President & CEO of the Lighthouse.